Ghosn, 63, declined to stay whether he will stay as chairman of the alliance for the plan's entire six-year period. PARIS -- The Renault-Nissan alliance will expand its electric car ranges and increase savings from closer integration as part of a six-year strategic plan that also fully integrates recently acquired Mitsubishi Motors in the alliance. The alliance is seeking to build on its leadership in EVs with plans to introduce 12 new full-electric vehicles by 2022, while extending the range and slashing battery costs. Member companies will launch 40 models by that same year with various levels of self-driving capabilities, including at least one that won't require any human intervention at all. 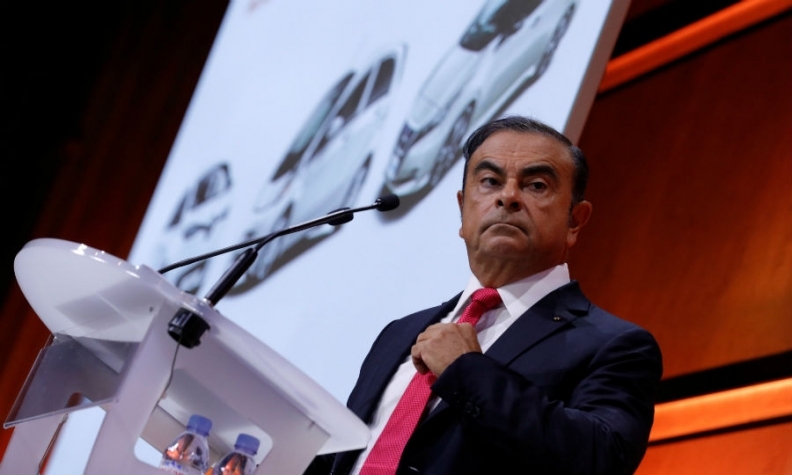 The Alliance 2022 plan was announced by group Chairman Carlos Ghosn in Paris on Friday. It aims to establish the companies as leaders in the electrification, autonomous and connected-car technologies that are upending the world's auto markets. Although the shift from internal combustion engines will be costly, Ghosn is betting that sheer size and the sharing of platforms and components will give the alliance an edge in the battle to dominate the future of transport. "We are going to use the scale we have to build more competitive advantages for the future," Ghosn said in an interview with Bloomberg News. "The big guys are going to have a big advantage in this situation." A new platform will provide the underpinnings for a future generation of electric cars. The next Nissan Leaf and Renault Zoe EVs will use the platform. A new common platform will be developed for midsize vehicles, adding to the alliance's current Common Module Family (CMF) architectures. Mitsubishi will gain access to CMF architecture and use common powertrains by 2020. By 2022, the alliance aims to build more than 9 million vehicles on four common platforms, up from 2 million vehicles on two platforms in 2016. As more models are launched on the new platforms by Renault, Nissan, Mitsubishi and their other brands, shared architectures will account for 70 percent of sales by 2022, with common engines installed in 75 percent. Ghosn has pledged to increase the pace of integration since Nissan took a controlling stake in Mitsubishi last year. The 18-year-old Renault-Nissan pairing has only recently begun rolling out cars on common architectures. The alliance said it will double savings from closer integration to 10 billion euros ($11.9 billion) by 2022, helped in part by increasing cooperation with Mitsubishi. Under existing plans, the alliance is seeking to increase synergies -- from cost cuts or avoided and revenue enhancements -- to 5.5 billion euros next year from 5 billion recorded in 2016. With 5.27 million cars and vans delivered in the first half, ahead of Volkswagen Group and Toyota, Renault-Nissan now claims to be the world's biggest automaker -- although parent Renault has never consolidated the sales of its 43.4 percent-owned Japanese affiliate into its own. While the alliance is the current world leader in cumulative electric-car sales, paced by the Leaf, the group needs to fend off increasing competition from longtime rival Volkswagen Group as well as newcomers such as Tesla, which this year introduced its mass-market Model 3 to great fanfare. With car-hungry China the latest country to announce intentions to phase-out vehicles powered by fossil fuels, following the lead of the UK and France, there's plenty at stake for automakers jostling to lead the zero-emissions segment. The strategy plan announcement disappointed analysts impatient for a new capital or management structure to speed integration and prepare Ghosn's succession. There was "no answer from Ghosn on the possibility of a merger by 2022", Jeffries analyst Philippe Houchois noted. Ghosn, 63, declined to stay whether he will stay as chairman of the alliance for the plan's entire six-year period. He stepped down as Nissan’s chief executive officer this year but continues to hold that title at Renault. Ghosn's current contract as Renault CEO expires next year. Convergence efforts will continue with no radical change to management structures, Ghosn said. "Six years is a very long period,” he said. "We are going to take it step by step." More information on operational and product strategies and financial goals are expected when Renault, Nissan and Mitsubishi announce their midterm plans in the coming weeks -- starting with Renault on Oct. 6.